I’ve gotten so used to being bored by mainstream country music that listening to “Little White Church” was a bit of a jolt. Thematically, it’s essentially the country spin on “Single Ladies (Put a Ring On It)”, though it could hardly be called derivative. I’m having trouble singling out what I like about the song the most. First, it’s refreshing to hear those harmonies again, which quite frankly make Lady Antebellum sound like amateurs in comparison. But the instrumentation is just as fresh as the harmonies. They both zig when you expect them to zag. Hand claps appear out of nowhere but don’t sound out of place. There’s a guitar riff before the final verse that just sounds so frickin’ cool, but before you can fully digest it, the vocals are back and suddenly incorporating a dry whisper. It sounds pretty frickin’ cool, too. And how about the lyrics? A woman refusing to allow her man to “ride the gravy train”, quipping that “I might be cheap but I ain’t free.” It’s hard to imagine a more audacious rhyme than pairing up “no more chicken and gravy” with “ain’t gonna have your baby,” though I’d be happily entertained by attempts to beat it. A few more records like Laura Bell Bundy’s and this one, and country radio just might get interesting again. Why Can’t I Buy This? This is up there with “Boondocks” and “I’m With the Band”, though it’s totally different. I really hope Capitol will get them back onto radio. Of all the mainstream groups that sprang up post-Chicks, they’re still my favorite. Welcome back LBT! Took them long enough. I like the song too – like Kevin, I missed though harmonies. Since I always like them best live, I imagine this would be awesome in that setting. I like this recorded version too though. It’s almost up there with Sugarland’s “It Happens” in the Makes Me Smile for No Good Reason category. From the clip this does sound promising. I do have to point out that a “gravy” and “baby” have been rhymed together in a kiss off song before, though. In Martina McBride’s “When God Fearin’ Women Gets the Blues” she sings, “I’ve stirred my last batch of gravy. You don’t have to be my baby.” Admittedly, its a pretty cheesy line, but it worked in the tongue and cheek tone of that song. I can’t speak to how its used here since its not in the clip…. so excited for the return of LBT! Chad, Can you not play the “Listen” link? …since abba i’ve been kind of a sucker for a blonde and a dark one, who can also sing. another good one from little big town. and yes, they are more interesting than $ 3.99 lady a. This is a GREAT song!!!! I hope it gets LOTS of radio play!!! Tom Karen is the dark haird girl & Kimberly is the blonde. Karen & Jimi (the dark haired guy) are married and expecting thier first baby any day now. It’s a boy. I concure Kevin John, you’re opening sentence says it all! In my ears, LBT are the tighest vocal combo in ALL of Nashville. LBT are my new Led Zeppelin, yeah, I said it! I grew up in the 70’s and 80’s and loved my Rock -n-Roll, but Led Zep was always the favorite. My tastes evolved over the years, taking me into many genres, and Country has been the predominant force for quite a while now. Once I was turned on to LBT beyond ‘Boondocks’ (a wonderful song; it’s their ‘Stairway to Heaven’) I fell in deep. I now own the whole catalogue, and have seem them live 5 times in the last year. ‘Little White Church’ is the kickoff single to what I already know will be their biggest selling Album. The rest doesn’t drop until Summer (early Summer I think and hope), but this little diddy should give it a real nice kick! Request LWC by LBT at your favorite radio stations! I want to hear the entire song… but I love what I hear! I love LBT and I hope they get back on radio. AWESOME song! I love LBT’s harmonies–probably my favorite country band. I heard it on the radio for the first time today and I really like it!! Hope it goes to the top! Wow! My new favorite song!!! Little white church says it all! Lyrics are great, music incredilbe! Reminded me of a beat similar to Constant Sorrow(O” Brother where art thou] A little Shania, Gretchen, & hank jr, . Reminded me of my story of the man I left after a 7yr. uncommited relationship! Finally ended that relationship! I am engaged to Rick, I love him so much, & he is taking me to a little white church this july in Vegas, & we are gettin Hitched!!!! I can’t get enough of this song… it just gets stuck in my head! Most of the time that’s a bad thing, but this one never seems to get old! This is definitely one of the better songs to hit country radio lately. It has a fun beat, but it doesn’t just ride the beat with no real purpose. It has a hidden message of the importance of commitment in a relationship. I’m psyched to see that Little Big Town is back in the country Top 20 for what feels like the first time in forever. However, I do fear that this song may be barred from the Top 10 because it’s from a mixed gender country group that is not Lady Antebellum. I don’t expect it to top the charts, but I would still be very happy if it did. 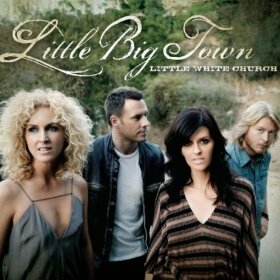 I included a review of Little Big Town in my post below.